I always knew that words are powerful, but I never perceived just how true that statement really is. What I am about to tell you is a real story, although even I wonder at it at times. It is my strangest kiruv story and, believe me, there have been a lot of them over my career. I have been active in Jewish outreach from as early as my teenage years. Being foreign-born helped me to understand people’s wants and needs. As a rebbi, I challenged my students to think about their Judaism. I had to and I knew that, if prodded, they would respond. It paid off royally. But this story… well, what can I say. When I came to this country in 1975, from the former Soviet Union, my father put me into yeshiva right away. Once a mature man, a rabbi and a rebbi, I felt it my duty to return to the fatherland. Maybe I could help out. One year, I finally did it. I went back to my country of birth for the funeral of my grandfather. While there, I decided to spend my two weeks in the Yeshiva of the Vaad L'Hotzolas Nidchei Yisroel, run by the Neustadt family, to pay back for what others did for me and to make my own unique contribution. I had been there just about the full two weeks when I took the boys on a trip to a park. This was a famous park because, years ago, during the Communist reign, there was a sign in that park saying, “No Dogs and No Jews Allowed.” And this was in Russia, not in Germany. I wanted to show the boys that, despite all the Communists’ efforts, we had survived, that we had a lot to offer and that, with Torah, their lives would be different. I had high hopes. I didn’t hold anything back. Once in the park, I called the boys over to one side and lectured them on the past, on Yiddishkeit, and who knows what else. That was it. After my two weeks, I returned home to the U.S. and pretty much forgot about the way life was over there. Two years later, my wife answered the phone. The call was for me. The voice of a young woman said to my wife, “Your husband doesn’t know me. We never even spoke; yet, he saved my life. Can I speak with him please.” A little apprehensively I took the phone and this is almost verbatim what I heard the young lady say. “You don’t know me. We have never met, but you saved me.” I urged her to explain what it is that she says I did. “Do you remember that group of boys that you took to the park? When you gathered them to one side to talk with them, I moved closer to listen. I hid behind a bush. I didn’t want anyone to see me, but I was drawn by their obviously Jewish appearance. You never saw me. None of the group suspected that I was listening. “The words you spoke were beautiful words. They were very inspiring. But, what really affected me was, that I started thinking. These people are Jewish and they are thinking about and even practicing their Judaism. I am also Jewish, but what do I know about Judaism? Nothing! “I investigated and found out that the boys were from the Yeshiva of Vaad L'Hotzolas Nidchei Yisroel. I went there and enrolled myself in the girls program. After that, I went to Israel, to a Shuvu school, where I have been until now. I am getting married to a young man who is learning in yeshiva and we want you to come to our chasunah.” I was flabbergasted, completely shocked, and utterly in awe at how He had allowed me to help another Jew without my even being aware of it, and also to find out about it much later on. Kosher slaughter, stunning, and the labeling of meat are three topics that are on the cutting edge today. In January, a short debate took place in the House of Lords in the UK, each speaker being limited to two minutes. After a half dozen lords demanded stunning to be required despite the freedom of religion issue, Lord Winston arose and said: Lord Robert Winston (Lab): My Lords, what other religion argues that its animals should not work on the Sabbath? And we do not “seethe the kid in his mother’s milk” because that seems cruel somehow. I would argue that the notion of animal protection is stronger in Judaism than in any other world religion. I want to speak purely as a scientist. We have heard a number of assertions here which are not scientific. With all due respect to the noble Lord, Lord Trees, death is not caused by exsanguination; it is due to interruption of the blood supply to the brain, which is immediate and has been measured. The problem with EEG measurements - electrode recording - is that they have been shown to be unsound. Indeed, the only way that you could detect pain would be by positron emission scanning of the brain, which clearly does not show any activity at all within two seconds once the blood supply has been cut. I would also argue that shechita is a much more humane method than stunning. Contrary to what some have said, it is a better method of killing animals because there is less suffering. Animals have to be calm and they are not manhandled roughly. The noble Lord, Lord Trees, is not the only one who has been to an abattoir. They are not pleasant places. It is never pleasant to see any kind of animal killed under any circumstances, but the truth is that under the Home Office Act we would not be allowed to slaughter laboratory animals with stunning because it would not be regarded as a proper way of culling an animal in a laboratory. It would have to be done by a method which is much closer to cutting the blood supply to the brain. I emphasize that what has been said about pain is another assumption. Of course, animals may move after the brain is severed but the brain itself does not perceive pain if it is damaged and, in fact, none of the organs below the skin has pain fibres. You have some pain fibres in your trachea but they are very small. The evidence that animals suffer severe pain after one cut with an extremely sharp knife is extremely arguable. The truth is that, once you are unconscious, nobody knows what the perception of death or pain is. To see the rest of this article, click "Buy this issue now" or "Subscribe" at the bottom of this page. So you are taking the family away or going by yourself to a faraway hotel with all the amenities, but you are not alone. For 2014, there are 50,000 slots in nearly 150 destinations throughout the world for those who can afford to go and who wish to do so. At an average of $4,000 per person for that weeklong stay, that adds up to the awesome sum of $200,000,000 — 200 million dollars spent for Pesach away. If everyone going away for Pesach would give just $100 to tzedakah (that is just 2.5% of what they are spending on themselves) it would add up to $5,000,000. Now let us consider the appeals made each year in our cities for the poor, those who cannot afford the basics of matzah and… as well as new clothing for the family — no trips, just the basics. Wouldn’t that $5,000,000 help to relieve those in need back in the communities which the travelers leave behind? We propose that each Pesach program organizer undertake to make an appeal BEFORE the program begins by adding a line to the contract with a check-off box allowing him to take an additional $100 per person to give to an organization in the traveler’s own town to help the needy make Pesach. 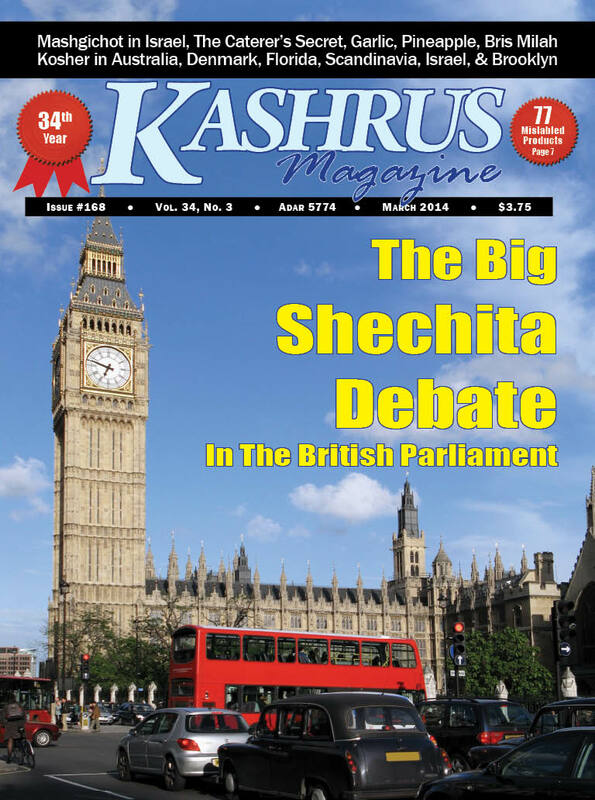 We, at KASHRUS Magazine, offer to make the shidduch between the donor and the chesed organization and to inform our readers of the magnanimous program organizers who participate. So, if you are an organizer, call us when you institute such a program, and, if you are a participant, please mention this idea to the group organizer. Certainly, appeals are made at the programs, perhaps for Torah institution or other worthy causes, but the poor among us have to make Pesach and if they have not been helped, they can’t. Make this year’s Pesach the most rewarding one ever. Shechita Banned In Denmark: As we go to press, Denmark joins Poland, Iceland, Norway, Sweden and Switzerland in banning kosher and halal slaughter. Denmark now requires pre-slaughter stunning which is unacceptable to Jews and Moslems. The Netherlands had attempted to ban shechita, but a deal was brokered, legalizing the practice in 2012. This ban was issued by order of Agriculture and Food Minister Dan Jørgensen who is quoted as saying, “Animal rights come before religion.” He did not go through Parliament, but acted on his own. Slaughterhouses will no longer be able to apply for an exemption from pre-stunning. Denmark’s 6,000 Jews currently do not practice shechita, instead importing kosher meat from abroad. However, this effectually eliminates the possibility of reinstituting shechita in Denmark. Jews around the world are attempting to affect a reversal of this ban, but, as Rabbi Pinchas Goldschmidt, president of the Conference of European Rabbis said, the Danish ban is a “further erosion of religious liberties and freedoms in Europe.” Threat to Ban Bris Milah in Scandinavia: Alarmingly, the movement to ban circumcision is growing across Europe. The trigger for the recent resolutions occurred in Germany in 2012. The district court of Cologne said circumcision “for the purpose of religious upbringing constitutes a violation of physical integrity.” The court ruled that non-medical circumcision of a minor amounted to a criminal act. The ruling was eventually overturned, but resulted in brief bans in Germany, Austria and Switzerland. Two months ago an overwhelming majority of Council of Europe assembly members passed a landmark resolution against non-medical circumcision of boys claiming that circumcision is a “violation of the physical integrity of children.” While the Council is not part of the European Union and cannot pass binding legislation, it is widely influential. Now, Norway is planning unspecified new regulations to “regulate ritual circumcision”. Likewise, just two months ago government advisers on child welfare from Norway, Denmark, Sweden, Finland and Iceland issued a joint resolution in favor of banning the ritual circumcision of minors. Jewish leaders, who have been busy with the movement to outlaw kosher slaughter, now have a new challenge to address. The European Jewish Congress announced the formation of an international working group to tackle these challenges to circumcision. Scandinavian Jewish groups remain optimistic that a solution will be found. In Sweden, mohelim are licensed by the Swedish health board and required to have a nurse or doctor present when the cut is made. In France, the Council of Europe resolution galvanized the Jewish community, which sent a letter to President Francois Hollande urging him to reject the resolution. On Oct. 30, Hollande replied with a letter assuring the community the practice is protected under French law. Fortunately, Borgen Brende, Norway’s Foreign Minister, wrote in a letter that the government “will not propose a ban on ritual circumcision...the Norwegian government recognizes the importance of ritual male circumcision for the Jewish community.” In December, Israel initiated a motion in defense of circumcision at the Council of Europe, an intergovernmental organization devoted to enhancing cooperation among its 47 member states. The Israeli initiative will be reviewed and possibly put to a vote by the assembly. The chairman of the Knesset committee on the Jewish Diaspora, Yoel Razbozov, said in October that, if bans are enacted, circumcisions should be performed at Israeli embassies in such countries. But Israel’s incipient role as defender of European Jewry is dividing local activists, with some warning that Israeli involvement could complicate the lives of Jews in Europe. To see the rest of this article, click "Buy this issue now" or "subscribe" at the bottom of this page.